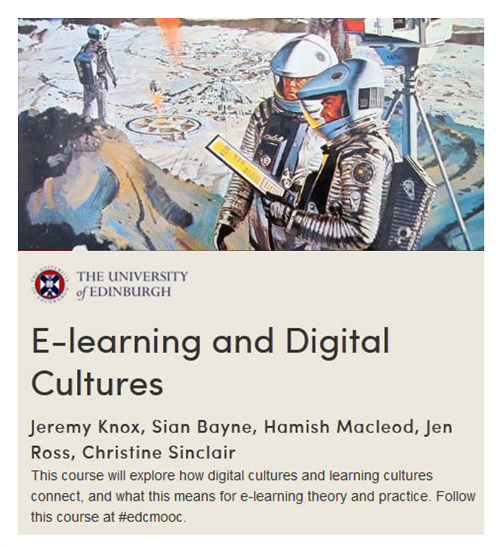 We are in our second week in the University of Edinburgh’s Coursera MOOC – E-Learning and Digital Cultures. 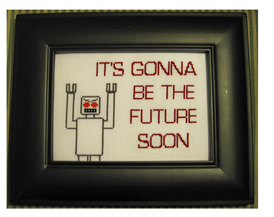 This was the image that greeted us when we clicked on the Week 2 page – a cross-stitch noting that its gonna be the future soon! Nice Flickr photo from krupp! Of course, we are typically pretty bad at predicting “the future.” I was in high school when the movie 2001: A Space Odessey came out, the movie from which the course banner comes. This movie vividly pictured a near future where moon colonies and space stations would exist by 1999. Our current International Space Station is cool, but nowhere as cool or massive as the one embedded in my teenage movie mind. Now, some 45 years later, the future is quite different from this childhood vision. 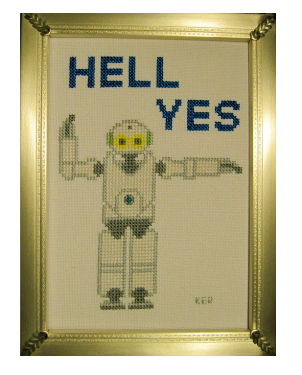 As Buzz Aldrin noted on the cover of MIT Technology Review back in November, “You Promised Me Mars Colonies. Instead, I Got Facebook.” Indeed! Yet, there were things the movie 2001 got right. Technology has pretty much invaded our lives, becoming ubiquitous and always on. Back in 1968, the movie depicted humans conversing with HAL – the intelligent computer on the Discovery spacecraft. Today, we converse with Siri. As with last week, the course facilitators began our learning journey with a series of short videos that had quite different views of the future. The first is a favorite of mine – A Day Made of Glass from Corning. This was the second video in a series, and both give a quite utopian view of the world where technology is seamlessly interwoven with our lives. The two kids in this video impishly used their tablets to shift the car interior to pink…and I could see my granddaughters doing the same thing. A similar world of integrated technology unfolded in Productivity Future Vision. In Sight and Charlie 13, we have a much darker view of the future, where technology is used to manipulate or track people against their will. This theme shows up often in science fiction literature and media. One wonders just how accurate the opening of each episode of Person of Interest is. We may already live in a world where technology is used to track us – if Hollywood is to be believed. These two world views were also evident in the readings. In Johnston, R (2009) Salvation or destruction: metaphors of the internet. First Monday, 14(4), an analysis of editorials about the internet showed that people tended to have either a utopian view of the web (transformative and revolutionary in a good way) or a dystopian view (destructive and supplanting humans in a negative way). Annalee Newitz in an address noted the combination of hope and fear as themes in science fiction (and I thought I was an avid science fiction reader – I had not read half of what she had!). I loved her comment about “You Can’t Stop the Signal!” That could be good news or not so good news. Bleecker, J. (2006) in A manifesto for networked objects — Cohabiting with pigeons, arphids and Aibos in the Internet of Things discussed the increasing degree to which objects are becoming connected to the internet and communicating with humans. Again, one wonders if one can (or should) stop the signal. Regarding education and these twin views of hope and fear, the course facilitators focused on the emerging phenomenon of MOOCs (massive open online courses). They used a blog post from Clay Shirky to provide the utopian view. In Shirky, C. (2012). Napster, Udacity and the academy. shirky.com, 12 November 2012, Clay suggests that the disruption that MP3s caused for the record industry might be a model of how MOOCs will disrupt higher education in a good way. Countering this is Bady, A. (2012). Questioning Clay Shirky. Inside Higher Ed, 6 December 2012, in which Bady suggests that Shirky ignores the profit-driven business model driving the development of some MOOCs. One image that stood out to me from his talk was how hospitals could be viewed as providing either a home or an institution, and how that view impacts interactions with patients. I was drawing the same conclusion about online education. In higher education, are we designing and delivering online education that is open, welcomes learning, and celebrates participation across a diverse group of learners, or are we building rigid institutions with strict rules of access and participation? Sidebar – totally stoked that Gardner will be keynoting at our Online Summit later in May! Surprisingly, MOOCs have never before appeared in a “Horizon Report,” though the technology was mentioned last September as a far-term technology in a separate report from the consortium, said Larry Johnson, its chief executive officer. Nearly six months later, MOOCs have moved to the forefront of emerging higher-education technology, according to the report. 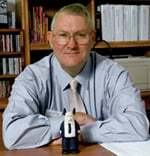 “It’s unprecedented,” Mr. Johnson said, noting that the closest parallel he can remember was the rise in interest in virtual worlds in 2006. “But even those didn’t catch on as fast as this is,” he added. On the other hand, there was some recent piling on when a Coursera course on “Fundamentals of Online Education: Planning and Application,” crashed and burned – primarily due to a lack of planning and application. For even more reading, check out the series of articles this month in MIT’s Technology Review. The articles focus on the business side of online education, but also suggest interesting fodder for reflection about learning. And…as Gardner ended his keynote with lines from Carl Sandberg’s poem “At a Window“, I hope we are at a window to watch “…and wait and know the coming of a little love” … a hopeful message rather than a dystopian one. For those in #EDCMOOC, I would as always be interested in your views. Agree? Disagree? Reframe the question differently? thanks for this – what a crisp and concise summation of the week! Mine is much more verbose!